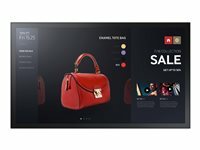 Samsung's PMF-BC displays combine the visual power of its signage with the touch-driven efficiency of its interactive offerings to better serve the needs of retail, public, corporate and transportation environments, among others. The displays allow consumers to seamlessly navigate a range of relevant content without interference from surrounding light or environmental conditions. The integrated, powerful Tizen operating system grants PMF-BC users exciting capabilities to deliver rich, engaging content with minimal operational burden required.Samsung's PMF-BC displays condense several vital signage components - including a powerful operating system, embedded media player and capacitive touch technology - into an all-in-one solution. Backed by the versatile Tizen OS, the PMF-BC displays deliver dynamic, touch-enabled content without requiring external PCs or devices. An intuitive interface further drives quick and convenient navigation across essential applications and content.Through capacitive touch technology and a user-friendly design, Samsung's PMF-BC displays foster a comfortable, easy-to-navigate digital writing experience. The interactive displays can accommodate up to 10 unique touch points while maintaining the smooth, familiar feel of analog board or pen-and-paper writing, and without interference from dust, sunlight or other natural variables.